YORKSHIRE coach Andrew Gale hailed Yorkshire’s Roses victory at Old Trafford after England Test captain Joe Root had claimed career-best figures. “That’s an awesome win,” said a delighted Gale as Yorkshire eased their relegation worries. “To come here and take the points is a fantastic effort. It was a very up and down game which kept you on the edge of your seat and was a great spectacle for county cricket. “After getting bowled out for 190 with the batting line-up we had – and a Lancashire hat-trick – I thought we were 100 short of where we wanted to be on that pitch in the first innings. But to come out and bowl in the fashion we did, got us back in the game. “The partnership between Brooky (Harry Brook) and Jonny (Bairstow) was fantastic in the second innings and the tail wagged and got us in a great position. “We knew if we bowled in the right areas for a period of time, we’d get our rewards. We’re quite confident where we’re at. We know there are areas we have to improve, but we have to keep working hard. If we do, we’ll be in the right place in the table. Root’s off-breaks claimed three of the four wickets to fall as Yorkshire secured this crucial Roses win by 118 runs during the third morning to improve their position towards the bottom of Division One. 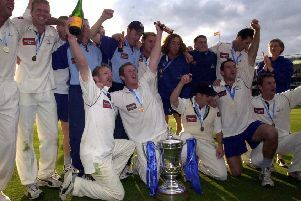 The White Rose’s third County Championship victory in eight matches also deepened their arch-rivals’ relegation worries given they have only secured one win from their first nine outings, losing five. Lancashire, who claimed only two points having been deducted one for a slow over-rate, were 194-6 with just Tom Bailey, unbeaten on 38, Graham Onions, Jimmy Anderson, Matthew Parkinson and injured Liam Livingstone to bat as they pursued another 129 runs to win. Home captain Livingstone fractured his left thumb whilst fielding on day one, did not bat in the first innings and came out at No 11 in the second without facing a ball as Lancashire lost their last four wickets for 10 runs. Root, having dismissed Jos Buttler in the penultimate over of day three, struck with the first ball of day three when Graham Onions edged behind for a duck. Shortly afterwards, he had Parkinson caught at first slip as the score fell to 196-8 in the 53rd and later bowled Anderson on the way to career best figures of 4-5 in 204 all out. Patterson also trapped Tom Bailey lbw. Yorkshire started this match second-bottom in the table, three points behind Lancashire with a game in hand. They are now 14 points clear of the Red Rose with that game in hand still in tact. Hampshire are one point behind Lancashire with a game in hand and 15 points behind Yorkshire with both counties having played eight. Just five batsmen posted half-centuries in this bowler-friendly fixture, with Bairstow’s second-innings 82 the best of them. Lancashire have not won a Roses Championship match since completing the double in 2011, the year they won the title and Yorkshire were relegated. Since then, Yorkshire have won four meetings at home and away and drawn three. Attentions return to the Vitality Blast, with Lancashire leading the North Group with five wins from six and Yorkshire having won three from five. Their next Championship outings come on August 19. Lancashire travel to The Oval to face leaders Surrey in a pink-ball fixture, while Yorkshire host bottom side Worcestershire at Scarborough. The Red Rose have only got one more home match in their remaining five – against Worcestershire at Southport – as the Old Trafford outfield gets relaid ahead of a busy 2019 summer. Lancashire awarded first-team caps to England duo Buttler and Keaton Jennings along with Dane Vilas. Anderson had the consolation of regaining top spot in the ICC’s Test bowling rankings. The 35-year-old, who has taken 540 Test wickets, climbed from second to first place, moving above South Africa’s Kagiso Rabada.